Leasing's share of U.S. new-vehicle sales has been at least 22.5 percent in every month this year, according to J.D. Power & Associates. DETROIT (Bloomberg) -- Toyota Motor Corp. is using $199-a-month leases on its Camry to keep it the top-selling car in the United States, much as it did to recover from record recalls and Japan's tsunami. Now it's pulling the rest of the industry with it. Once primarily a tool for selling luxury vehicles, leasing is becoming common among hot-selling family sedans, such as Ford Motor Co.'s Fusion and Honda Motor Co.'s Accord. Supported by high used-car prices, low interest rates and Americans' tendency to buy vehicles based on the monthly payments, U.S. auto leasing is at the highest levels in at least a decade and pacing the industry's best year since 2007. "It's a great way to present a product at very affordable monthly prices," Peter DeLongchamps, a vice president for Group 1 Automotive Inc., the fourth-largest U.S. auto dealership group and one of the nation's biggest Toyota retailers, said by telephone. "There's absolutely no question" Toyota is using leasing to contend in an increasingly competitive mid-size car segment. Leasing's share of U.S. new-vehicle sales has been at least 22.5 percent in every month this year, according to J.D. Power & Associates. The four top months for lease penetration in the last decade, the extent of Power's data, were in 2013, and each of the year's first six months rank among the top nine, the researcher said. The momentum for leasing is driving U.S. car and light truck sales to a six-year high. Deliveries may climb 15 percent for July to 1.33 million, the average estimate of nine analysts in a survey by Bloomberg News. The annualized industry sales rate, adjusted for seasonal trends, may climb to 15.8 million, the average of 15 estimates, from 14.1 million a year earlier. The industry sales pace for the month keeps the U.S. on track for its best year since 16.1 million vehicles were sold in 2007. It's also further evidence of the disparate paths of the American auto industry and the city of Detroit, which filed the nation's largest municipal bankruptcy in history this month. The reasons for leasing's strength extend beyond the race for the top-selling U.S. car. Industrywide gains in product quality and strong used-car prices allow automakers to project higher values for their vehicles when leases expire. This trend is combining with record-low interest rates in allowing the companies to offer cheaper monthly payments. Leasing has historically tended to be more common on high-end models, accounting for roughly half of sales for some. David Welch, a product manager for a technology company in San Jose, Calif., signed a two-year lease on a Mercedes E350 4Matic during the Fourth of July weekend. "Moving into luxury cars, it made so much more sense to rent them than to buy them," Welch said in a telephone interview. "For two years, I've got a car where I've only got to put gas and insurance into it." Leasing's expansion into more mainstream segments also can cultivate loyal customers who can move up into higher-priced vehicles for their future purchases, said Kevin Tynan, an auto analyst for Bloomberg Industries in Skillman, N.J.
"It does create move-ups," he said. "Instead of being in a compact car and having to lease, you'll get people up from compact cars into mid-size cars by being aggressive there." Buyers are showing "growing acceptance" of leasing in more segments, including mid-sized cars, said Bill Fay, a Toyota group vice president. The prices paid for Toyota's vehicles at the end of their lease, known as resale or residual values, tend to rank among the highest in the industry. "We're going to leverage a good position we have from resale values to use that as an advantage," Fay said in a phone interview. "It allows us to offer very competitive monthly payments." The ability to offer Camry at cheaper monthly rates is crucial as Toyota tries to stem declining demand for the car in the year's first half. Camry deliveries slipped 2.9 percent to 207,626, according to the Automotive News Data Center. Competitors, including Ford, Honda and Nissan Motor Co., are closing in on Camry, the top-selling car in the United States for the past 11 years. A 20 percent surge in Honda's Accord deliveries during the first half cut its sales deficit to Camry by 65 percent from a year earlier, to less than 21,000. 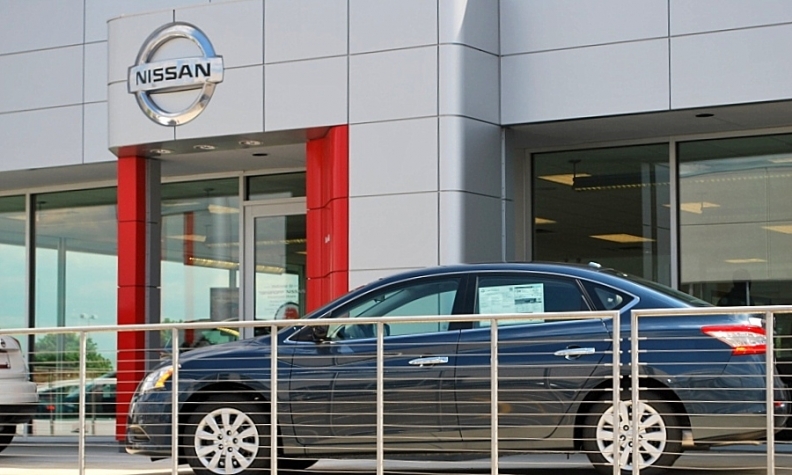 The Altima, one of seven models that Nissan lowered prices on beginning in May, has trimmed its shortfall to Camry by 30 percent, to about 40,000. And Ford has pared Camry's lead on its Fusion by 40 percent, to less than 47,000. All four automakers probably will post increased July sales across their respective lineups. Ford may report a 17 percent gain, the average of nine estimates. Deliveries probably will rise 17 percent for Toyota, 16 percent for Honda and 13 percent for Nissan, each the average of seven estimates. The analysts' average estimate for Honda sales is in line with the forecast John Mendel, the company's U.S. executive vice president, gave in a telephone interview. Deliveries will be up 16 percent to 18 percent for the Honda brand and 6 percent to 7 percent for Acura, he said. Leasing is "a way to reach consumers that were risk-averse and hesitant to jump out there and buy a new car," Alec Gutierrez, an auto analyst with Kelley Blue Book, said in a telephone interview. The leasing rate for Camry rose to about one-fourth of sales in each month early in 2013, from 20 percent or less a year earlier, according to the researcher's data. Buyers are showing "growing acceptance" of leasing in more segments, including mid-size cars, said Bill Fay, a Toyota group vice president. The rise in leasing activity extends beyond top mid-size car contenders. Leases were 20 percent of GM's U.S. sales during the second quarter, up 4.6 percentage points from the same period a year earlier, CFO Dan Ammann said last week during the company's quarterly earnings call. GM said it outpaced the growth in leasing for the rest of the industry, which was up 2.5 percentage points to 24.3 percent of all sales. The company, which is preparing to roll out a wave of new models in this year's second half, probably will lead all automakers this month with a 20 percent sales gain, the average of nine estimates. "As long as things are going in that direction, it can't ever get too high," David Westcott, a dealer selling GM's Buick and GMC brand vehicles in Burlington, N.C., said of the leasing rate. Westcott is chairman of the National Automobile Dealers Association. Ford is more cautious in its views on the trend of increased leasing activity. The company's leasing business has been increasing as a share of its U.S. sales, although its mix is still below the industry average, CFO Bob Shanks said in a phone interview. "If you go back though in the prior decade, there were periods where leasing was excessive," Shanks said last week. "I don't think we want to return to those days. We just want to be able to provide the appropriate level of leasing depending upon who's out there and interested in our products." Automakers and lenders moved away from leasing during the financial crisis, with Chrysler Group's predecessor abandoning the market in 2008, as the credit markets seized up and residual values fell. Since GM and Chrysler's bankruptcies the following year, GM has acquired AmeriCredit Corp. and renamed it General Motors Financial Co., and Chrysler has formed an auto-financing venture with Banco Santander SA. Chrysler sales may increase 16 percent in July, the average of nine estimates. The company's residual values have been on the rise, helping boost sales of 200 sedans and Dodge Dart compacts from the lot of dealerships such as Extreme Dodge Chrysler Jeep Ram. "We love two-year leases because people come back in two years," said Wesley Lutz, the owner. He said leases have accounted for about one-third of the Jackson, Mich., store's sales this year. Leasing will stay strong as long as used-car prices remain at historically high levels and interest rates continue to be low, said Group 1's DeLongchamps. The Houston-based dealer group reported revenue of $2.34 billion for the three months ending June 30, a quarterly record for the company. "Finding low-mileage late model cars is still very difficult," he said. "The supply is improving a little bit, but you still see leasing activity happening because the residuals are so strong. Interest rates are still cheap."